Single unit of our 100mg Quinoa Crunch CBD chocolate bar. Large – 1.7oz. 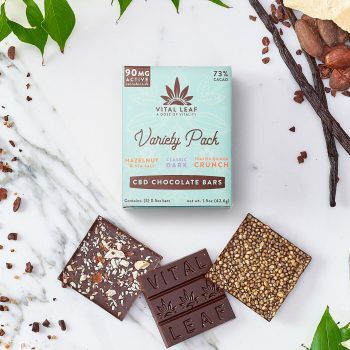 Indulge in this handcrafted, artisanal Quinoa Crunch CBD Dark Chocolate Bar. This healthy twist on the crispy crunchy variety of chocolate bar is made with 73% Cacao and sweetened with organic coconut sugar. Toasted popped quinoa give this bar a satisfying crunch that traditional popped rice chocolate bars do! It’s an incredibly tasty & guilt-free way to indulge in your daily dose of vitality! Vital Leaf sources only the finest organic, fair-trade, regenerative and ethically sourced cacao on the planet to ensure we are maximizing the healing potential of our products and that our impact on the environment & people is a positive one. This bar is a special collaboration with our friends at ImLakesh Organics, where we source this popped, crispy Quinoa from a Regenerative farming collective in Bolivia. You can also visit our friends at Yellow Seed to learn more about how to support the regenerative cacao movement. 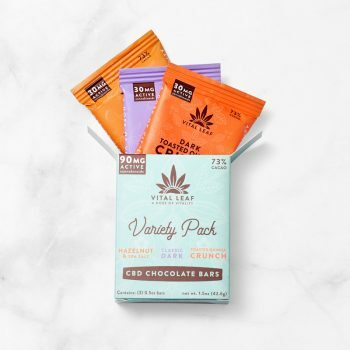 Ingredients: Organic fair-trade cacao paste, organic fair-trade cacao butter, organic coconut sugar, organic popped quinoa, phytocannabinoid-rich full-spectrum hemp extract, organic vanilla bean, sea salt.